Today, Drew and Patrick are discussing New Avengers 9, originally released August 28th, 2013. This issue is part of the Infinity crossover event. Click here for complete Infinity coverage. Today, Patrick and Drew are discussing New Avengers 8, originally released July 24th, 2013. Today, Spencer and Patrick are discussing New Avengers 7, originally released June 19th, 2013. Spencer: The more responsibility you have, the harder it is to find time to yourself. I consider myself fortunate to have a job that I can ignore completely on my days off, but if I was, say, a CEO or the president, I just wouldn’t have that luxury; there are no days off when you’re that important. As the self-appointed protectors of our universe, the Illuminati fall firmly into that camp. Even as the threat of the Incursions recedes for the moment, they’ve still got more than their fair share of life-or-death, morally gray decisions to make. Today, Ethan and Drew are discussing Indestructible Hulk 5, originally released March 20th, 2013. Today, Patrick and Shelby are discussing Aquaman 17, originally released February 27th, 2013. Patrick: When I originally got my friend Taylor into comic books, I suggested Scott Snyder’s Swamp Thing series. Taylor was intrigued, saying that the idea of a Captain Planet made of Plants seemed like a really fun book to read. Of course, Snyder’s Swamp Thing has more to do with elaborate mythologies and alternate futures and cool stuff like that, but that idea stuck with me. We read so few comic books about superheroes that stand for anything. Our heroes are driven by revenge or obligation or circumstance to fight crime, but none of them end up championing any causes – they just keep fighting whatever supervillains pop up to challenge them. After the events of Throne of Atlantis, Aquaman finds himself wedged uncomfortably between the roles of superhero and supervillain. What other choice does he have than to enact his own values and forge his own path? Today, Taylor and Mikyzptlk are discussing Dial H 7, originally released December 5th, 2012. Taylor: Imagination enjoys an awkward place in our modern day society. While most people and institutions are quick to praise the use of imagination it is far more rare to find those who actually appreciate it. Seldom are we, as an audience, treated to something that is truly unique – whether it be in a movie, music, a book, or any other medium. While the complexities of this relationship with creativity are of too much detail to go into here, it will be said that a fair amount of imaginative endeavors are rebuffed due to the general population’s resistance to anything that diverges too far from their expectations. Many inventive music artists aren’t signed to major labels because their music isn’t traditional pop; many writers have to rewrite parts of their book so they will appeal to a larger base audience; and many TV shows craft generic characters and plots so that they will be liked by many, but perhaps loved by few. However, the comic book industry has always managed to buck this trend in many ways since its very inception, which itself was a departure from accepted norms. Whether this is due to the type of reader the comic book attracts or the type of artist it employs for its creation, I can’t say, but it seems like comic books have always been more willing to take imaginative chances than their counterparts in other media. Dial H is a perfect example of this daring and the seventh issue of this title is an excellent example of its imaginative prowess. Today, Shelby and Patrick are discussing Aquaman 0, originally released September 26th, 2012. 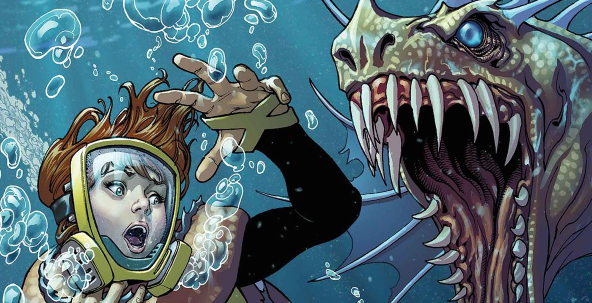 Aquaman 0 is part of the line-wide Zero Month. Shelby: Geoff Johns is a big picture kind of guy. When he gets an idea, it’s a big idea. This plays out well in trade paperback collections of his story arcs, when you can read them in great big chunks. It doesn’t always work so well in the monthly issues; when a huge story is dragged out over months, the pace slows and it’s hard to keep that big picture in your mind. I think Johns found a solution to the problem: just write an issue with a story so big it spans all the oceans, treat it like the opening scenes of a movie, and give your artists plenty of elbow room.